These oatmeal chocolate covered raisin cookies are a cross between the best oatmeal chocolate chip cookies and homemade oatmeal raisin cookies! If you are a fan of both oatmeal cookie recipes, you are sure to love this spin on a classic cookie recipe! I am obsessed with all things oatmeal raisin cookies (and chocolate covered raisins) so these oatmeal chocolate covered raisin cookies were a no brainer! The best of both worlds! Let’s talk about pet peeves, shall we? I remember back in college a professor asking each of us to introduce ourself by sharing our biggest pet peeve. It wasn’t until that exact moment that I realized just how much you can learn about someone by a pet peeve (and vice versa…a whole lot of strangers learned about my irritation with drivers who refuse to use their blinker). Well, today, I’m going to share with you one of my current pet peeves (lucky you! 😉). Why is it that some people feel the need to spit their chewed up wad of gum onto the ground instead of, oh, I don’t know, placing it a nearby trashcan? Or even placing it back in the wrapper until a trashcan can be found? You see, not only do I find this gross, lazy, and lacking in common courtesy, without fail, if there is gum somewhere in the near vicinity, I will unintentionally find it and step on it. These chocolate covered raisin oatmeal cookies, on the other hand, are the best. You can pretty much cover anything in chocolate and I’ll love it (well, within reason–Fear Factor, I’m looking at you) so chocolate covered raisins are a pantry (and midnight snack) staple. Oatmeal is another pantry staple because I’m 95 years old and have a bowl of oatmeal for breakfast 87.3% of the time (totally accurate) so these oatmeal cookies were a long time coming. Really though, these cookies are the best of both worlds. When it comes to either oatmeal raisin cookies or oatmeal chocolate chip cookies (and these chocolate covered raisin cookies), I prefer to use a higher ratio of brown sugar to white sugar. 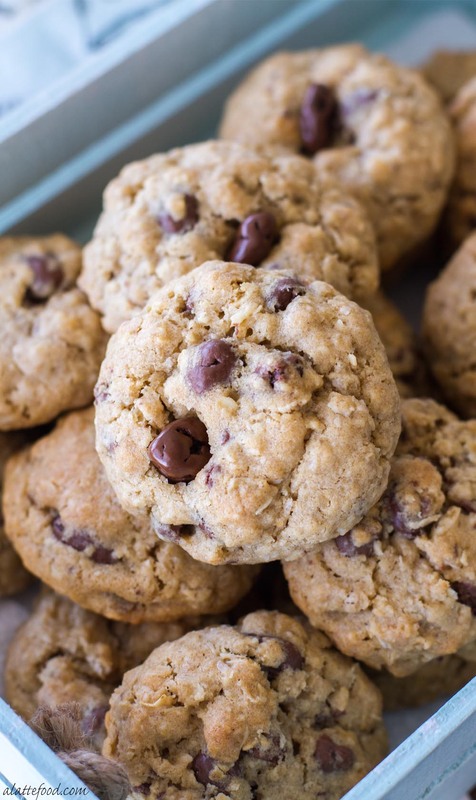 It makes for a nice chewy oatmeal cookie with a hint of molasses flavor. All right, so for these chocolate raisin cookies, you can use either milk chocolate covered raisins or dark chocolate covered raisins (or a combo!). I used dark chocolate (because dark chocolate rules all), but either would be fine. Finally, when it comes to oatmeal cookies, you need sub out some of the flour in the recipe and add in old fashioned rolled oats. Definitely use the rolled oats (rather than instant oats) because they yield a much better texture in your oatmeal cookies. In a separate bowl, sift flour, salt, cinnamon and baking soda. Slowly add dry ingredients into the wet ingredients. Once combined, add in rolled oats and mix. Lastly, add in chocolate covered raisins and stir until combined. Allow dough to chill for about 20 minutes. Scoop cookie dough into 2 Tbsp-sized dough balls, and bake for 13-15 minutes, or until the cookies are lightly golden brown. Recipe originally posted in 2016; updated in 2018. Since we just moved into our new house I have been telling myself I HAVE to make oatmeal cookies!! A house is not a home until you have cooked a batch of oatmeal cookies, right?! I love chocolate covered anything, and these cookies are definitely calling my name — yum! Oatmeal cookies are my favorite! Yours look perfect! OMG YES! Why can’t people put their gum in a trash can! I totally agree! Ps. these cookies are amazing! These cookies look great! Love that oatmeal chocolate AND raisin combo!